Home » 5 Freshest » Crakroc: chocolate, marshmallow, toffee…. Admittedly, not the most helpful photo. Let’s open up. Ok. There she is. But aside from being gorgeously natural looking, what exactly is it? 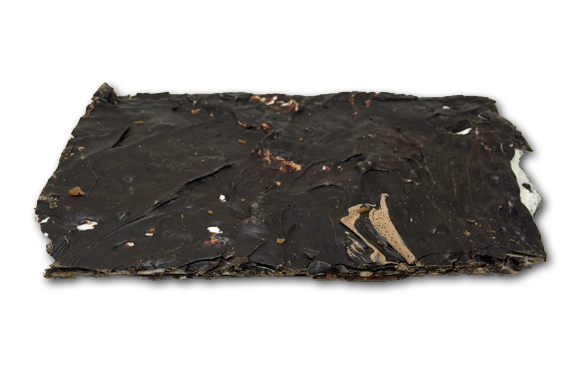 It’s a large plank of goodness is what it is. It’s one of the best sweet treats I’ve had in years, that’s another thing it is. It’s Crakroc, fools. This is just showing a piece flipped over. You can really tell how thin the marshmallow center is- hella thin. Back to my original quandary: how to describe it. Not so much the flavor or constitution of it- but the texture. This thing has a texture that is super addictive, and also that highlights the flavors amazingly well. 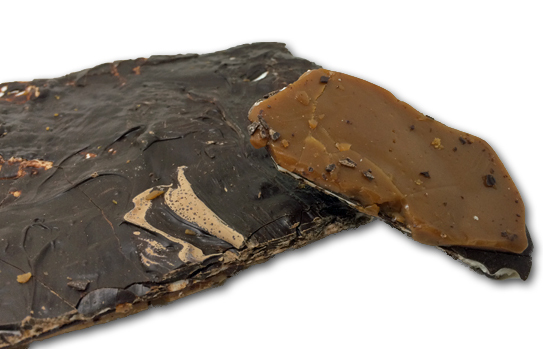 The toffee side is not hard- there’s no cracking when you’re break a piece, and it’s not runny. It bends, and it tears off with just a little pull. But the crux of the issue is whatever the marshmallow layer is doing. If you’re a regular here, you know I’m not a marshmallow lover. Too marshmallow-y. But this….they’ve basically found the absolute perfect application for marshmallow’ because (I think) it changes the consistency of this bar from snappy crispy chunks of goodness to soft, sumptuous, bites of truth. That’s the way I’ll describe it, BECAUSE I CAN’T THINK OF A BETTER WAY. There’s nothing to compare it to. The other day, I told Mrs. Guru (who’s basically taken over ownership of my Crakroc) my issue, that I couldn’t compare the consistency to anything I’d ever tried before. She said, “no, it’s not that difficult, it’s like…..it’s like…..lemmee think.” That’s the last I’ve heard from her about it. Even if you had told me the ingredients, shown me the bar, and told me about the consistency as best as you could, I likely still would have thought it wasn’t that special-that’s how unique this thing is-it needs to be tried to be believed. On a cool note- every Crakroc we buy gives a donation from Crakroc to help a kid get throug drug rehab. That’s a very cool thing for this company to do. 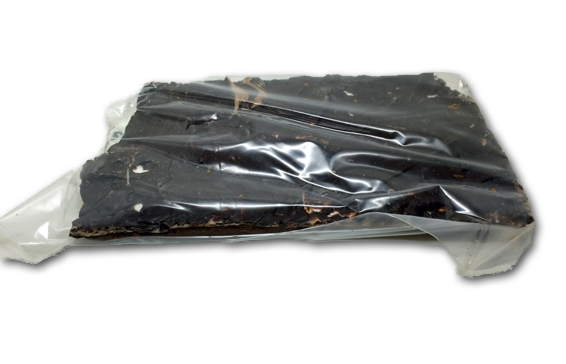 Crakroc comes in several flavors- dark and milk chocolate, with or without coconut, peanut butter, almonds. Oh, that’s yet another cool thing: the bag I’m reviewing, the dark chocolate with marshmallow and toffee-there’s no almonds used to make the toffee, thus Jonny Guru Jr. can eat it. Usually toffee is off limits for him as we never know whether almonds were used to make it or not. In short, these things are named appropriately. They’re amazingly addictive- slight crunch, nice chew, mega flavor. I WILL buy this as a gift, and for myself, and I highly recommend you do the same. This is so very clearly handmade, you can’t help falling in love with it. Crakroc: it’s what’s for dinner. Seriously, that’s what I ate after the Super Bowl Sunday night, for dinner. Please click the link below and check them out, I promise you won’t be disappointed. 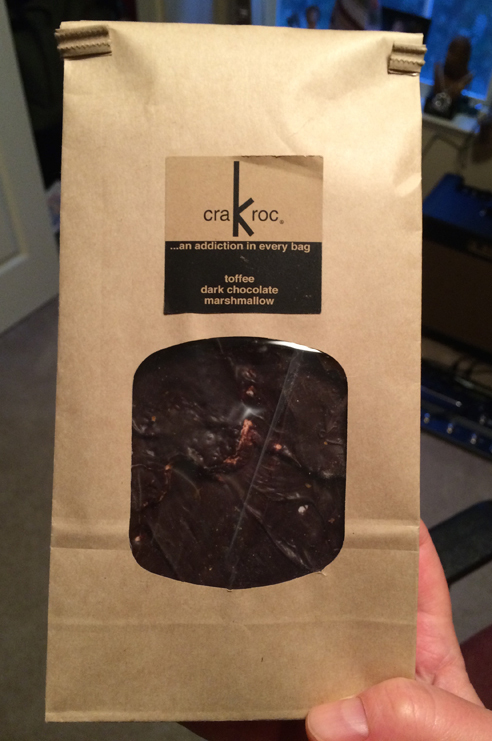 As a confirmed chocoholic I have a new addiction to craKroc for quite a while. I just can’t believe it’s half chewy. It looks totally hard toffee-ish. have to try it. Ok I tried it. It’s fantastic.